An important and sometimes overlooked step in preparing the beard for the Classic Wet Shave is applying a good Pre-Shave Oil. 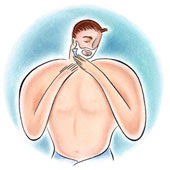 The main purpose of a pre-shave oil is to add an extra protective shield between the razor blade and skin. It also softens facial hair and opens skin pores to ensure a close shave. These oils are made up of natural oils, such as coconut, sunflower, olive or other oils that are drawn from plants. They're also low on the grease factor, so they won't clog pores and cause damage to your skin. After the beard is softened from the steam of a shower or a hot towel, dry your face and then apply a dime-size drop of oil to your fingers and work the oil through your beard area. I like to start from the neck up. Next step is to apply your shave cream with a badger hair brush. The lather of the shave cream has a lot of tiny air pockets in it and the oil “fills in the blanks” for complete skin coverage. Also, the combination of the water, pre-shave oil and shave cream causes the facial hair to swell. This enhances the cutting action and sometimes permits cutting the hairs deeper below the surface of the skin for a super close shave. There are many pre-shave oils out there, but one of the classic shaving products that I like is Taylor of Old Bond Street Pre-Shave Aromatherapy. Taylor has a thicker consistency than some of the others and a very pleasant scent. I also like Truefitt and Hill Ultimate Comfort Pre-Shave Oil which has a lighter density and also smells great. Using a pre-shave oil is a must.